For any future planning, I have created these easily extendable location maps. Please, feel invited to use this map for any location proposals, you have in mind. Magenta - Caves | Caves with a black outline may need to get repositioned or removed. Dark Gray lines - Proposed additions of cliffs, mountains or rockgroups. Perfect, good work worsas. This will be highly useful! A version with cell numbers would also be great. Agreed, it's a great stuff. The level you bothered yourself to with presenting the topography of my Druadachs claim... awesome. I can see the point of having the dirt road through the forest now, too. I agree with adding new cliffsides around that Breton tower south of Markarth. This area now feels too sparse by comparison to it's surroundings. I can see the southern one being made mostly of overgrown boulders, I think that's how Farmlands slopes mostly look like? I'm not sure about moving Scamp's wizard grotto location, really. It makes a good spot for a lone queer mage to live, in remoteness, but still not so far from society, were he to had need for it from time to time. Plus come on, are there any videogamers not thinking "let's check behind it for some secrets!" anytime they see a waterfall? I like the rest of proposed changes a lot. You are right about the grotto. Probably just fine where it is. I have really only taken all this effort of creating this map so I can paint in the mountains and rivers for the rest of Skyrim exactly the way I imagine them. But I have lost interest for now, because it was a huge pain in the a*** to make this map. I'll get back to it later. And as said, feel free to use this map for any additions you have in mind. 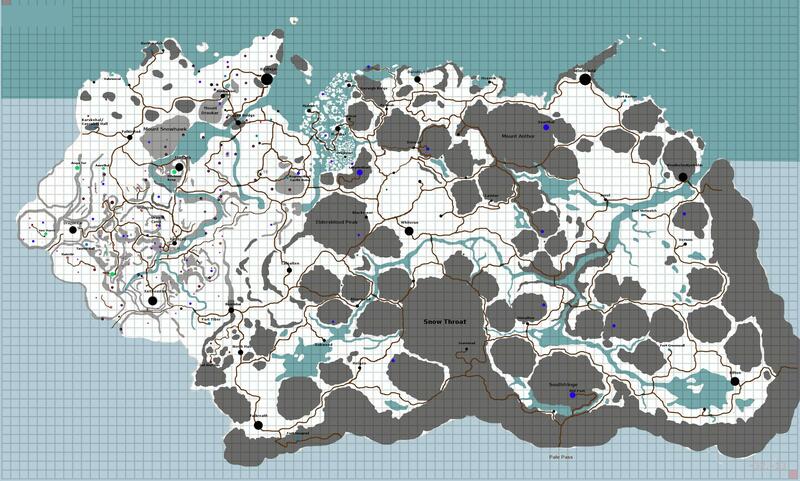 I wanted to see, whether some of the fortress ruins from TES V would fit into the Reach yet (Harmugstalh, for example), although it is generally difficult to map anything from their Skyrim to ours. The town of Sungard in Arena was in the Rift, btw, not the Reach. That location has taken a long journey. I'm not sure I like the waterfall anyway. It's just a bland wall of water coming out of nowhere. Maybe we could work on something a little more fancy, with smaller and larger streams coming down the cliffside and feeding the river. The cave entrance would be visible, but hard to reach in between the streams. Are we talking about the waterfall near Karthwasten? As the source of the Karth River, it could stand to a bit more grand. Making this waterfall grander sounds like a good call. There is lots of space to play with here and there are already quite a few waterfalls/grottos by this cliffside, so it shouldn't really look out of place. I'll give this a go within #25 claim. The side-source in #27 could receive some work too. I found an old county map which is outdated in a lot of aspects, but it can still be useful some places. I would like to update this location map workshop with the outcome of the recent claims and the proposals made in the internal section. So, are these river suggestions seen here supposed to overwrite the previous decisions on the course of the rivers? What's the state on the reachmen village in berrys 2nd claim? Will we replace it with a nord ruin or will the village where it is? That would be a great help in future planning. I'm not sure on the course of the new northern river, but the axing of the two rivers south of it (as well as the old one going straight north) is agreed upon I'd say. I agree with removing the little diagonal river between markarth and the Wineries. But entirely removing the thick river on the border between Reach and Haafinheim seems like a waste to me, considering that it's completely detailled on that section you want to cut. I'd rather use my proposal for that tribute river in the OP, which is about making that river thinner and shorter but not removing it. I can work with that. It would indeed be a shame to see finished exteriors go, but the river still looks visually unappealing to me on the map, compared to the alternative. But we can keep it, if narrowed and shortened. Ideally give it a small bend or two. Edit: I think I'm misunderstanding something, I was talking about the (indeed, diagonal) river going through the plains. Gah. Only had three hours of sleep last night, please excuse me. The river east of the wineries can stay (if thinned). So I have updated the maps in the OP according to recent proposals and the brainstorming on the northern coast of Haafinheim. I have changed my mind about the proposed legion fort in The Reach, so put it where suggested by Roerich. 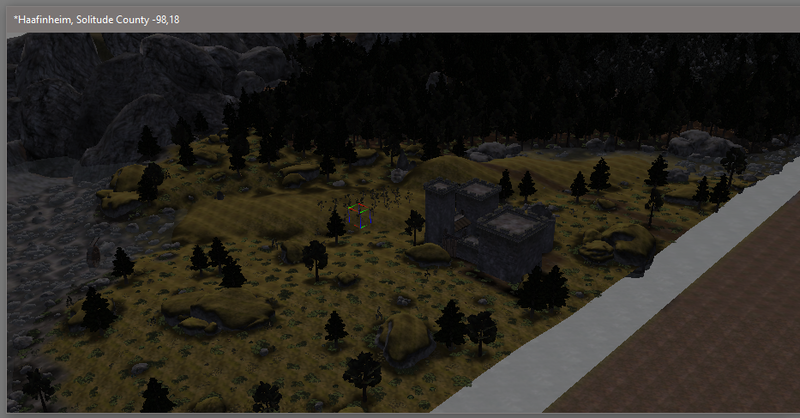 I also added suggestions for the locations of Northwatch and Fort Tiber. For the rest of the province I have painted in how I imagine the mountains to be like by mainly taking orientation on how they are seen on the skyrimmap of the 1st pg. I also added in some of the more important cities and towns for orientation. Northwatch location seems good to me - it would make sense for Imperial forts to be most prominent near the coasts and the external borders. Cascabel needs a spot in western Haafinhiem. Yeti wrote: Cascabel needs a spot in western Haafinhiem. Hmm, I've always had half a mind about adding Cascabel. For starters, it's only ever mentioned in that book. The author could just have made the name up, even if inspired by actual events and locations. I'm not sure what race someone with a name like Tenace Mourl would be, but certainly not Nord. The presence of Aerin in Maar Gan is the only thing giving credence to the truthfulness of the book. Secondly, the name and description sounds very not-Skyrim to me. The name is obviously Breton, and there's no way a castle in any part of Haafinheim could be able to grow plentiful apple orchards. If we should add it, it should be in the westernmost part of our lands. But I think it would make more sense to be located in the Western Reach proper. Or we could go another route, and 'Nordify' it, explaining the name and tales of apples to an imaginative author, who just looked up a map of Skyrim and saw 'Karsknhal' or something like that, and decided to use that as a setting, spicing it up a bit. Or we could even add it as an inhabited Direnni ruin, explaining the name. Anyway. If we add it, it should be one of the 'Imperial fiefs' annexed by Thian. 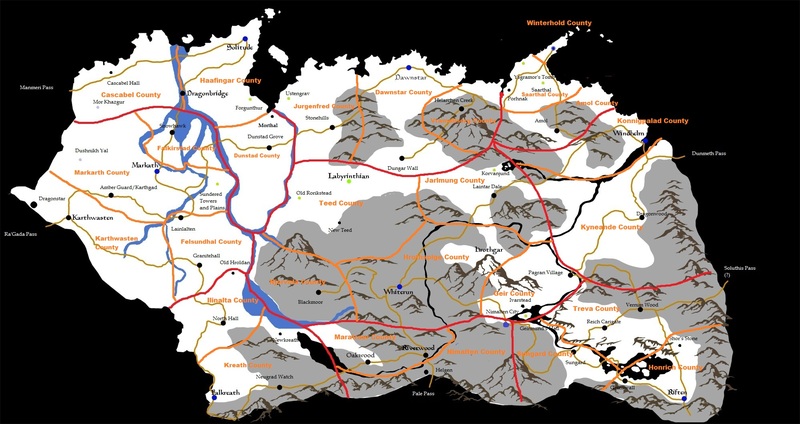 Edit: the new plainlands region right next to markarth and the farmland region would actually be a feasible Haafinheim area to grow apples. It could possibly be done in the southern "northern shore region" as well, as long as we're far enough west for the land to be completely thawed. The castle on your screenshot looks great, but I wouldn't use it for Cascabel. The only half-way suitable location for Cascabel, in my opinion, would be where Taurus Hall is currently located on the map as an annexed piece of Highrock. As a nod to the book you could add 2-3 durable apple trees to the garden and just say that the author greatly exaggerated or that the climate worsed since that time. We could always still turn the legion fort next to Dragonstar into Taurus Hall in order to avoid having to rewrite our book on the legion in Skyrim. In-game books rarely fit the locations they describe (especially the mountains of trashy adventure stories Bethesda was so fond of writing), so any discrepancies are easy to re-work. I agree it could be one of the Imperial fiefs Thain later annexes. I like the Nord name Karsknhal, by the way. I am still fond of making its local ruler a Bosmer who somehow scammed the surrounding land away from the former Count. It should be a settlement with a strong Breton influence - something I'd say we need after giving the Redguards so much attention on their border with the province. Definitely not a new architecture set, though. I haven't shared this on the forums yet, but my idea for these "Imperial fiefs" is that they're holdings the Empire took over and rewarded to Imperial nobles to punish Haafintheim after The War of the Red Diamond. Worsas, perhaps we can use it as a Haafinheim border fort instead? I agree with your proposals. And Yeti, I agree, if we add Cascabel in some form, the ruler should definitely be a Bosmer. And your idea about the Imperial fiefs is perfect. We should work out a comprehensive list of these fiefs and holdings. I'm thinking it could be everything from castles like Cascabel to perhaps a manor in Dragon Bridge (and toll rights? ), a number of farms etc. And Roscrea. There should be more Imperial fiefs in Haafinheim. Whatever happened to The Pale? 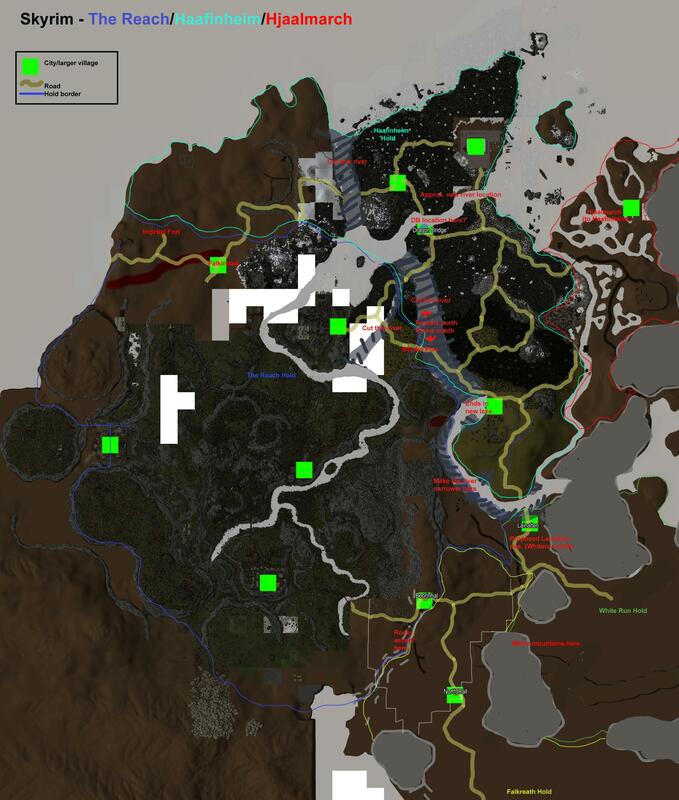 In TES V it shifted placement from south to north, being the hold of Dawnstar. On earlier maps it was the southernmost. If we wanted to, we could cut the western part of the Rift and the rightmost (mountain-filled) part of Falkreath to create this new, mountainous hold. It seems wrong that the Rift would be roughly the same size as White Run. This should also be the location of Old Fort, near Pale Pass. I think the Pale has never been officially in the south of Skyrim. The Pale was merely mentioned as one of the eastern Skyrim holds in the 1st pg but not further described in nature. 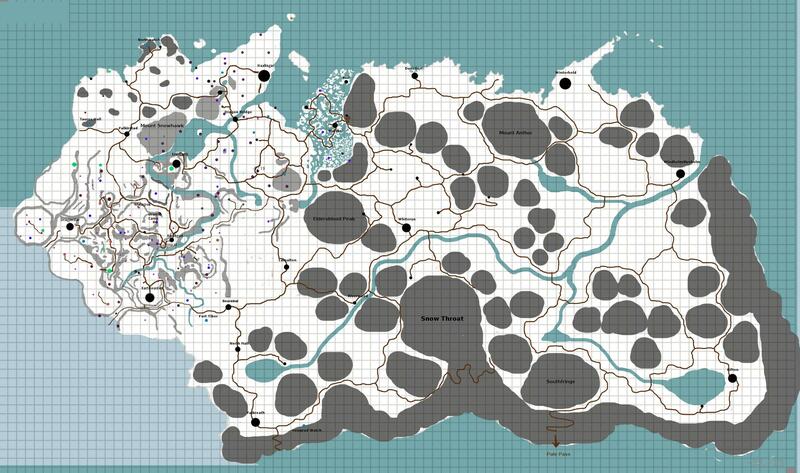 The fan-made maps placing The Pale along the southern border just assumed it would be there because of the Pale Pass. If we want to go the "correct" path, the Pale will be where it was in TES V, replacing the hold of Northshore. Generally speaking, I don't think the current hold sizes are a big problem. Our Skyrim is proportionally quite different from Bethesdas and doesn't need to have the same proportions for the holds. On hold sizes - I wasn't refering to TES V, just my own perceived understanding of the Rift's level of power. I edited the map to include the new Hjaalmarch layout. I also messed around with some new road networks and village/farmstead proposals. And I updated some of the new Markarth claim stuff, but not all of it. Edit by Worsas: Moved your updated xcf-file to the OP. Ok, I assume you have the needed authorization to edit the opening post? If yes, feel free to edit it after each update you make. And if it's too bothersome, feel free to replace with an OP of your own. I think that should be possible. 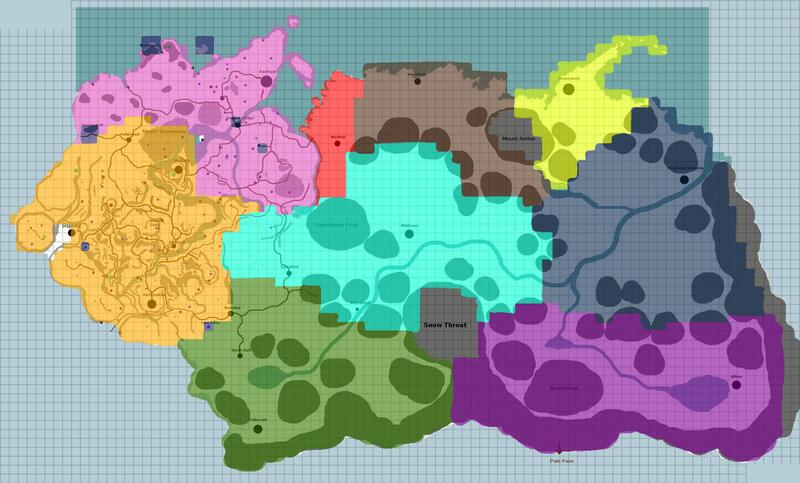 There are actually a few details that would have to be updated on the location map (sanctuary on the island, name of the mountain in Haafinheim, nord ruin instead of the Reachmen village in the Druadach), but I'm only posting it for the record and it can be edited in anytime. I don't mean to shove off work to you others necessarily, just saying that anybody can do these updates. Another thing for the mere record: The white river and the other rivers feeding into it, are a bit lame at this point and could use more work. For one, I'm not sure if the lake illinalti should be that far east. I could just aswell see it starting a little bit east of Snowthroat. It would look a bit more natural. Also, the river should change its width the further it goes east and could use a bunch of further small tributaries. Edit: Have we agreed on placing Cascabel Hall where there is currently Taurus Hall on the map? It wouldn't be a problem, as we can still name the legion fort next to Dragonstar like that. Thanks. I'm working on a newer edition, adding in new names and some more proposals. I just checked and the border with cyrodiil is at a height of roughly 24,000. This is also the highest altitude in Cyrodiil at the moment. We should see about exceeding this height for Mount Anthor, Eldersblood Peak, Southfringe and Snow Throat, of course. All of these should steer towards the 30,000 units mark. Oh, it will be. As high as the engine allows us to. After all, it is the highest mountain in all of Tamriel.